Virtue is a piece of digital artwork by James Christensen which was uploaded on January 13th, 2010. 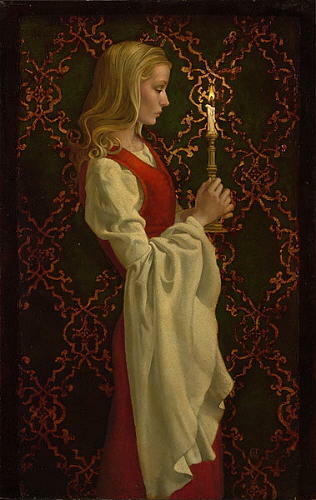 Virtue, as described by The Greenwich Workshop, publisher of James Christensen's work, depicts a graceful young woman, who though she may walk a dark path, with determination and focus as her guiding principles, will surely find her way. This image serves as a classic and elegant reminder to stay true to your beliefs, that faith and strength will see you through the dark times. There are no comments for Virtue. Click here to post the first comment.